The weather in San Antonio has hit the triple digits. The best way to beat the heat without a pool in my opinion is to snack on some fresh, chilled fruit. I’ve been buying fresh pineapples lately and keeping them in the fridge till we’re ready to chop them up for a fresh fruit salad. 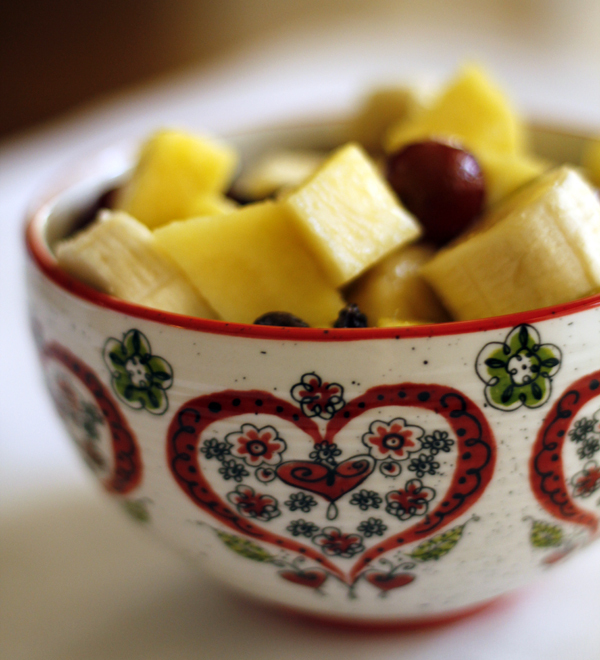 Pineapple, grapes, bananas. I keep it simple, but sometimes I also add raisins, nuts, apple slices or mango. Whatever looks good or is on sale at the store will do. Looks like this weekend will be in the 100’s, I’m taking suggestions on how to keep cool this summer! This entry was posted in Sweet Recipes. Bookmark the permalink. I like to keep coconut water around when it gets this hot. It’s really hydrating, and I make popsicles with it mixed with a little fruit juice for my son. Great idea! You can make delicious popsicles out of anything. We’ll definitely be trying that.